The photo above was taken by fellow actor Pamela Sinha backstage at the Tarragon Theatre just before a performance of "The Little Years". I'm an actor who has spent eight seasons with Stratford Festival of Canada. 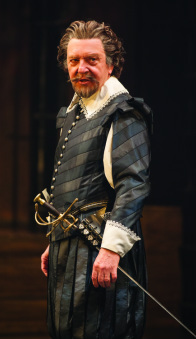 I played M. de Treville, Captain of the Musketeers, in the 2013 production of "The Three Musketeers". Before playing Treville, I spent a month in Paris, and have devoted much of this website to sharing the fun I had, exploring Paris as a musketeer. Start with the Introduction, or jump right to the Luxembourg Neighbourhood. Photo by Cylia von Tiedemann.